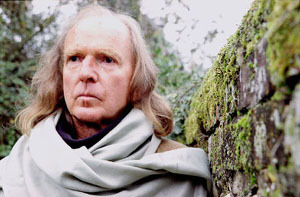 Last night’s Soundstreams concert at Trinity St. Paul’s was devoted to works by John Tavener and people who were close to him. The principal performers were soprano Patricia Rozario, Choir 21 and the Toronto Children’s Chorus joined, as needed by Christopher Dawes on piano and organ and Erica Goodman on harp. Conducting duties were split between Elise Bradley and David Fallis. There was plenty of explanatory material from artistic director Lawrence Cherney plus some from Ms. Rozario as well as taped comments from Tavener to set up the pieces. 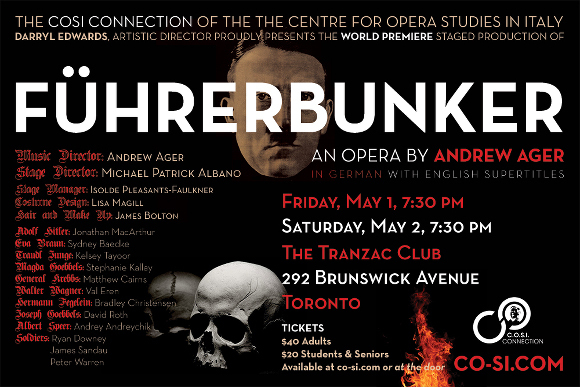 Andrew Ager’s Führerbunker is coming to Toronto under the auspices of the Centre for Opera Studies in Italy. It plays at the Tranzac Club on May 1st and 2nd at 7.30pm. It’s a one hour piece, in German, dealing with the last days of the Hitler regime. There’s an article about it at Musical Toronto. Tickets are available here.